This is a photograph in an album from the Hampshire People family. 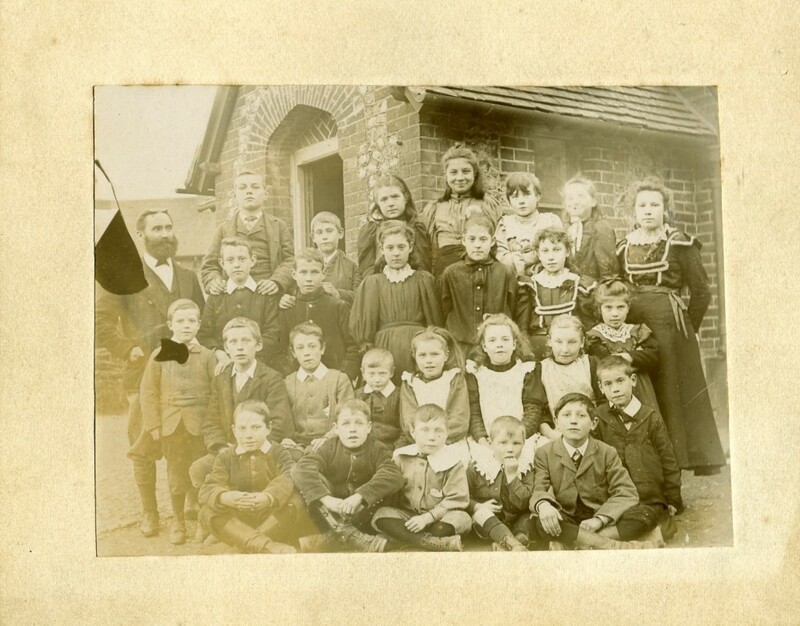 The picture is probably taken at Smannell School around 1900. Last Tuesday (16th April) I did a talk for Wiltshire Family History Society – Devizes Branch on “Using the Internet to learn how to do a one name study” I talked about what I had decided I needed to do and how much help I had found on the Internet. Some has to be paid for but much is freely available. Genealogy websites and blogs including “The Genealogy Guys” which I listen to in the car or on the train, and “Dear Myrtle”. Most of the people there did not realise how much was available. And it was quite an eye opener for them. At the end I was asked about progress on finding Fanny Richards my Great Grandmother. I gave a little update and said I should know more in the Autumn. Last Monday (5th March) I had my first visit to the new Worcester History Centre at The Hive in the centre of Worcester. Eileen went shopping while I spent a couple of hours on the history floor (the second floor). I have very little need for Worcestershire records but it was interesting finding my way around and looking at the books and records that are available. There is more open access than others I have been to anyway. On Wednesday evening I met David Chilcott to talk about how I might help with the Wiltshire Family History Website. I quickly realised that not only is there quite a lot to do but that I could be taking on more responsibility than I expected. On Thursday on the way back from the Wiltshire History Centre I called into the Wiltshire Family History Society Resource Centre in Devizes and met the Finance Committee, they expected that I would be taking over the website at some stage. It would be a big challenge and particularly the need to move more into social media. At the end of my session at the Wiltshire History Centre I looked at the books on parishes on the shelves. There was a slim volume by Audrey Tomlin on Castle Eaton Church (1992). The church is St Mary the Virgin. The booklet indicated that in 1550 Humprey Galimore was appointed Rector. He was new Church of England rector. After Queen Mary brought back Catholicism he was replaced in 1554 by Gilbert Bursley. There was an inquisition in 1555 at Cricklade for John Cryppe the elderwhen the Goddard’s (of de la Zouche descent) who had been landowners and decided who was rector were replaced by Anthony Hungerford and John Cryppe of Meysey Hampton. In 1558 Queen Mary died and Elizabeth came to the throne. Humprey Galimore was reinstated as the Rector and the Goddards returned. I know that the Goddards were also the land owners in Latton. William Peopell was married 5 November 1554 in castle Eaton. It was clearly a tumultuous period. So did William Peopell get married before or after the catholic rector arrived. Did the family move to Latton (and then to Hannington) with the Goddard’s or for some other reason? These are all interesting questions to be explored by looking at the dates, the Goddard family. I need to look at the inquisition as well. Did William Peopell arrive with the Hungerfords or Cryppes or leave for Latton because of them? Is this a red herring? The book also gave me some pointers to other places to look for information including a book on Hannington by Claude B Fry limited edition published 1935 and the Wiltshire Tax list D A Crawley. I also found out that Castle Eaton was known as Eton Meysi or Eaton Meysy and Water Eaton was known as Eaton Mynchan or West Eaton. On Thursday and Friday (7th and 8th March) I spent time at the Wiltshire History Centre at Chippenham in doing some “Peapell” Research room. My father John Hurley runs the team of volunteers who are transcribing Wiltshire parish records. They do a great job and make the records on baptisms and Burials and other records available through the sale of CDs and sites such as Findmypast. I wanted to look at Carolyn Fenwick’s book “Poll Taxes of 1377, 1379 and 1381 Part 3 Wiltshire – Yorkshire” looking for “Peapell”. I found many uncommon and even some odd names. These included “Cruchman”, “Baylemound”, “Totobold” and “Bongy”. They are very rare on census and parish records from mid 1500’s onwards so I am sure these are nick names or by-names. I did not find any remotely possible “Peapell” references even allowing for wild variations in spelling. I can infer that either (i) “Peapell” had not been adopted by this time as the surname or (ii) “Peapell” were living in another part of the country or (iii) they evaded the poll tax. I did however find a few “Howes” surnames. Ii sent an e-mail to Paul Howes who is studying the name to let him know that I would send through details. He was very interested. The poll taxes lists were interesting not only for the unusual names but also that some names were missing or rare. For example there were a relative low number of “Smiths” in Wiltshire at most three opn a page of 200 names and in many pages none at all. There were far more “miller” derived names such as Miller, Milner, Mullward etc. Smith is now a much more common name now that Miller even though it wasn’t then. On Saturday 16th February Gerald Cooke organised another Gloucestershire Regional One Name Guild meeting at the National Star College, Ullenwood, Cheltenham. There was a packed agenda which started at ten o’clock in the manor house. It was organised by Gerald and Alan Moorhouse. We started with a round table introduction about each study which provoked questions. What surprised me was how many were “stuck” around the civil war and inter-regnum. The third item was FamilySearch & Family Tree. This provoked some discussion about the merits of family trees on line and allowed us to see the different approaches and views of guild members present. Linking to others trees and information can be problematic if not checked carefully. We broke for a great lunch (which we all brought for ourselves) and the opportunity to purchase some of Alan’s Marmalade proceeds to the National Star College. After Lunch we reviewed software we used and then looked at archiving our studies. I have just finished a five week course on Medieval Documents run by Gillian Waters of Pharos. This is my second Pharos course the first was Helen Osborn’s Introduction to One Name Studies in the Autumn. I have also been using the on-line Palaeography (Handwriting) course on the National Archives site to improve my understanding of documents and allow me to read them. During the five week course we were introduced to lots of on-line resources and sites covering many different record types. I particularly wanted to find older references to “Peapell”. The first record that I can be certain is a “Peapell” variant is the marriage of William Peopall on 5 November 1554 in Castle Eaton Wiltshire. There are no other Peapell references in Castle Eaton Parish Records but there is a marriage of a John Peopell in Latton the next parish to the west in 1584 and another marriage of a different John Peopoll in 1620 in Hannington the next parish to the east of Castle Eaton. I started off by looking at all the known information about the people and their spouses and gathering any background information I could on wills, landowners and parish details etc. The wills and landowners suggested areas to look as did the later marriages and occupations. The Peapell were not wealthy but did make wills disposing of land etc, had occupations like milners (miller), carpenters etc and were marrying the local clergy, merchants and traders. Extending the search to relatives by marriage helped identify an initial research strategy. The next step was to identify potential church, military and taxation records. Although No on-line references were found to Peapell there are other sources to look at Wiltshire History Centre probably during March. A happy new year for 2013. I have made good use of the Wiltshire Parish Marriages CDs for all parishes (published jointly by Wiltshire Family History Society and Nimrod Marriage Index) and added to the Peapell family marriages. I have also been steadily capturing more sources where I have had gaps. I completed the Family History Course. It was a five week “Introduction to One Name Studies” by Pharos run on-line in October. It was very useful and I have rethought my approach to the “Peapell” study as a result. I have now started the Family History Course. “Medieval Documents” again by Pharos on-line and is run on-line. At the end I be able to gfind more documents to help me explore the Peapell family back before 1550. . I have had a very busy spring and summer but now autumn is here I can get down to the Family History again. Since Last April we have had an eight week break from work including four weeks on the Outer Hebrides, our son’s marriage, the usual canoeing and lots of other things to do. Excuses excuses. The only real Family History I have to report was at the West Midlands Family History Fair at Worcester. I helped my father, John Hurley, run the Wiltshire Stall at Worcester Warriors Rugby Ground is conveniently not far away and he can stay over night with us. We had some interest in Wiltshire families and met some old friends including the son of our old minister in the 1960’s from the Baptist Tabernacle in Swindon. The One Name Guild stand was next to ours and I met Kirsty Gray the One Name Guild chairman who was helping out on their stall. She has known my father and my late mother Beryl Hurley for a long time. This week I start a Family History Course. It a five week “Introduction to One Name Studies” by Pharos and is run on-line. At the end I should understand what I should be doing and be better able to respond to queries about the Peapell family.